Interested In Joining Our Network ? Click your type of organization to see why joining our global network could be beneficial for your organization. Is your type of organization not in the list? Feel free to contact us to discuss the possibilities. For companies it is ideal if the regional Chamber of Commerce mediates in interns. They help companies and also help creating jobs for young professionals. 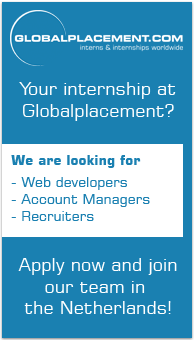 Company networks can offer their members an easy way to find national and international interns on Globalplacement.com. We also offer a revenue model for company networks if they wish to own a Globalplacement white-label. Because of the aging problem, Governments see a problem develop with companies that are not sold in time. These companies cease to exist, leaving an average of 10 employees without a job. Because of this, each year 100.000 employees lose their job in the Netherlands alone. 52% of the bachelor students has ambitions to become an entrepreneur. This creates opportunities for ministries of economics to inform companies of graduates, to see if there are possibilities to transfer the company over time. Job boards can offer two new products to their product portfolio: national and international interns and young professionals. Through an API we will provide your clients with the right applicants. Recruiters can offer their clients two new products: interns and young professionals. You can simply offer your clients our agreement, so that they will be provided with the best interns and young professionals. There are 175 million students worldwide. Universities wish to distinguish themselves in interesting study programs and thereby interesting internships. Most of them have gathered local companies around them. They can ask these companies to register on Globalplacement.com. The advantage is that their local students can directly search for preferred internships. They will also see the foreign possibilities. 62% of all students would like to do an internship abroad; through Globalplacement this can be arranged immediately. We also offer a revenue model for universities if they wish to own a Globalplacement white-label. Student networks can offer their members an easy way to find national and international internships on Globalplacement.com. We also offer a revenue model for student networks if they wish to own a Globalplacement white-label. Trade associations can inform their members that they can make a difference by using interns. Trade unions can ask their employers for internships during negotiations. It’s good for companies and society. Worldwide Globalplacement does business with UNI Global Union. This trade union federation consists of a collaboration between 500 trade unions that represent the interests of 20 million employers worldwide.